Back in November I mentioned that plans were afoot for Catherine Zeta-Jones to produce a movie about a Welsh village rugby team in which the intention was for the perma-tanned Gavin Henson to play himself in a cameo role. Not only is there no news on any progress in getting this movie made (thank heavens - it sounds utter rubbish) but it looks as if Henson has been beaten onto the silver screen by his Ospreys/Wales (same thing these days) team mate Ickle Shane Williams who plays himself (who else?) in "Hope Eternal", the latest film by Welsh director Karl Francis which premieres at the Hay Festival this week (hardly Cannes, but you've got to start somewhere). The plot - for what it's worth - revolves around a Welsh doctor who introduces the joys of Welsh rugby to a Madagascan AIDS worker and her daughter (seriously) who then travel to Wales in a bid to meet Ickle Shane. 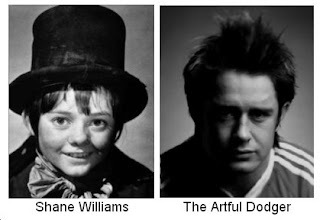 Notwithstanding that really Shane should be auditioning for the role of the Artful Dodger in the West End, I must congratulate him on his new found status as the darling of the Welsh media. And not a tube of fake tan in sight.